This year’s Shoot-N-Hoops Basketball Clinic will be held Sunday, December 9 at Webster University. For the past 20 years, the Webster University Men’s basketball team, and their head coach, Chris Bunch, have made the Shoot-N-Hoops Basketball Clinic a part of their annual tradition. 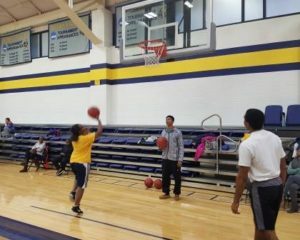 Participating Arc athletes learn different basketball drills including dribbling, shooting and blocking to improve their skills from the Webster University players. The Shoot-N-Hoops clinic started out small but has grown to include 30 athletes. In the beginning, the clinic only taught simple drills to the athletes, but over the years it has progressed and now includes a friendly scrimmage between the Webster University players and the participating athletes at the end of the day. This partnership not only provides skills training for Arc participants but also provides the men of Webster University’s basketball team the opportunity to volunteer and make meaningful connections to people in their community that have other abilities. The Arc feels very privileged to be a part of the Webster University community, and we are honored to have been part of their family for the past 20 years. On behalf of the St. Louis Arc basketball program, and our past and present athletes, we would like to thank Webster University and the Men’s basketball team for their incredible support over the years. It has been an amazing and exciting journey for all! We look forward to many more years of Shoot-N-Hoops with them. Please leave A public reply to this post. Once approved, your comment will be posted to the St. Louis Arc website. Your email address will not be published. For general inquires please select “Contact Us” to the right of the page.